Hiving is a site where you can earn by taking paid surveys and more. But is Hiving a scam or a legit survey site worth joining? I have joined and tested the site myself to find out. In this Hiving Surveys review I will give you all the details, so you will know exactly what to expect, and if it is a site worth joining or not. What is Hiving Surveys and what does the site offer? Hiving has existed since 2009, so it has been around for a while. Let me reveal right away that it is a legit survey panel. However, this does not necessarily mean it is worth joining. So let’s go over what it offers, so you can see for yourself and find out, if it will be worth it for you or not. 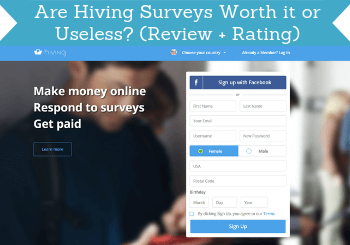 As the name of this review suggests, Hiving Surveys is a platform that of course offers paid surveys. This means you can get paid to share your opinion on different topics. You will receive an email, when there is a new survey available for you. You can see the time a survey will take in the survey invitations. In the email you can see how long the survey approximately will take. You can however not see how big the reward is, which is a bit strange and not very user-friendly. I prefer sites where you right away can see the size of the reward as well. If you log in to Hiving to check the available surveys, you can however see both the estimated time and the earnings here. Once you click the link in the email invitation, you will get a few pre-screener questions. After this you will be redirected to the survey, if you qualify. On the actual survey, you might have to answer some of the same pre-screener questions again. This can sometimes be a bit annoying, but does luckily not take too long. Be aware that it can sometimes take a bit of patience to find the surveys you qualify for, but there should be a good amount in most countries. Hiving Surveys does however not offer as many surveys as many other sites. Exactly how many opportunities you will get depends a lot on the country you live in. But in general, you should not expect more than maximum 2-3 surveys per week. This means that Hiving can be a good site to join as an extra site, but if you want as many earning opportunities as possible, you should also join some of the top paying survey sites, as Hiving alone will not give you enough opportunities in my opinion. Hiving also gives you the chance to earn by taking micro tasks through the platform Figure Eight. This can be all kinds of small online jobs like for example checking for errors on a website, validate information, small typing tasks, and more. Examples of micro tasks you can take on Hiving. It can actually be a good way to earn some extra money. It will however take some patience in the beginning. At first the tasks pay very little per task, but as you do more, you earn trust, and then you will qualify for higher paying tasks. Eventually it can be a great way to earn some extra money. If you like doing these tasks, there are in my experience however sites that are better for taking the exact same tasks. You can for example also take Figure Eight tasks on ClixSense, and here you do not only earn for the tasks, but can also earn some great bonuses by doing the tasks. So these micro tasks can definitely be a great way to earn in the long run, but you should consider taking them somewhere else than on Hiving to get more out of them. At times Hiving Surveys also offers product testing. This means you can get to test a new product and give feedback for it. Sometimes you get to keep the product, and other times you get paid for doing the test instead. This option is not available in all countries, and it is just once in a while. But if you are offered this, it can be a great way to earn a little extra or get a new product for free, while at the same time get to test a new product. You can earn a little extra by inviting friends to join Hiving Surveys, if you like the panel yourself. In the “tell a friend” section, you find a field, where you can put the email address of the friends you want to invite. You can earn a little extra by inviting friends via email. You can also choose to share on Facebook through a button in this section. If a friend ends up joining and validate their account, you will get 600 points (equivalent of $0.60). So it is not a huge reward, and it would take a lot of friends to make any real money by doing this, but a little extra can also be nice. Once in while Hiving Surveys run lotteries, where you can win big cash prizes. These will be announced on their blog and on the website in the members area. Be aware that you have to pay to participate in these lotteries, and they are not available all the time. You can definitely win some really great prizes by participating, but you can also end up not getting anything out of the points you earned and invested into this. So whether it is worth it or not depends on how much of a gambler you are. As you can see, Hiving gives several opportunities to earn. The best way to earn is by taking the paid surveys. But how you will then get paid, when taking surveys or doing tasks is of course also important to know before joining. You earn points every time you participate on Hiving Surveys. These points can then be exchanged into different rewards depending on your preferences. Hiving Surveys offers 4 types of rewards. You can exchange your points into cash through PayPal, use them for the lottery, donate to charity, or gift the points to a friend. I like survey sites that offer PayPal as a payout method, as this is such a great and easy way to get your cash. So in my opinion this is the best option on Hiving Surveys, unless you would like to donate to charity, which can also be great, if you do not necessarily need the money yourself. 1000 points is equivalent of $1. This can be a bit different depending on the country you live in and the currency your account is in. You can get a payout through PayPal, when you have earned 4000 points, so it is actually a pretty low payout threshold compared to many other sites. However, because of the limited survey opportunities on Hiving, it can still take some patience to reach this, and there are survey sites that pay out a lot faster, because they have more opportunities and higher rewards. You will however get a 300 points joining bonus on Hiving Surveys, once you have filled out your basic profile (only takes a couple of minutes), so when you first join, you are getting closer to payout from the start. As already mentioned, you will not get daily survey opportunities on Hiving. This also means you will not have huge earning opportunities. If you also use the micro task option, you can earn faster, but as already suggested, you get more out of taking these tasks on other platforms. So overall you can earn a little extra cash on Hiving Surveys, but there are many sites with more opportunities. In general, you should however remember that no matter which survey sites you join, it will not make you rich or a full-time income. It can be a great way to make some extra cash by sharing your opinion, but you just have to do it with the right expectations. Then it is one of the easiest and fastest ways to start earning some extra cash online. Taking surveys on your mobile is a great way to earn a little extra, whenever it fits into your day. That is why I personally like when survey sites are easy to use on mobile devices. Hiving Surveys does not have an app, and sites that have this are usually very easy to use on mobile. However, the website itself is fully optimized on mobile, and very easy to use on most screens. You do however not really have to log in to take surveys on your mobile, as you will receive email invitations via email. So as long as you can access your emails on your mobile, you will be able to take surveys from Hiving there. Be aware that most of the surveys are however from third parties, which means some of them might not necessarily be optimized for mobile. So even though the Hiving Surveys website itself is optimized, you might have to scroll in and out a bit for some of the surveys. Who can join Hiving Surveys? Hiving Surveys is available in more than 50 countries. What makes it very user-friendly is that in most countries the platform and the surveys will be in your own language. The rewards will even be in your local currency. A great thing about Hiving Surveys is that it is also available in countries that do not usually have that many survey opportunities and platforms to join like certain countries in Africa, South America, and Sout East Asia. But it also has panels in countries that in general have many opportunities. In general, you should also check out the list of the best survey sites in your country, as you in many cases can find sites with more opportunities. But Hiving Surveys can still be worth joining as an extra site, and in some countries it offers you to join, even though it normally is difficult for you to find legit survey sites to join. Being able to get support is important on any survey site. Hopefully you will never need, but it is nice to know the option is there in case you one day need it. On Hiving Surveys you can submit a support ticket after you have logged in. You have to choose between different topics depending on what you need help with. Once you have chosen the topic, you will at first get info about the most frequently asked questions about this topic. If this does not answer your question, you can choose to send a message with a specific question. I have however seen complaints online that the support is not very good at getting back, but I have not yet needed support myself, so I cannot confirm if this always happens or not. Be aware that at the moment you cannot contact the support, if you are not already a member. You have to login to contact them. Hiving does however have Facebook pages for different countries. You can try to contact them here. The Facebook pages I have seen however have very little activity, so you should probably not expect it to be a channel they use very much. Hiving Surveys has both good a not so good sides. So let’s finish this review by summing up the pros and cons, so you can get a better overview and see, if it is a site for you or not. Overall, Hiving Surveys can in my opinion be worth to join as an extra site, but if you live in a country where the top survey sites are available, you should definitely join some of these as well. Hiving Surveys alone does not give many opportunities, and it can take some patience. But it is easy to use, it has a low payout threshold, and it pays out through PayPal. 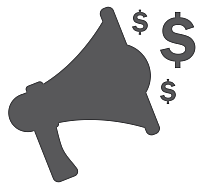 So if you want to join as many sites and get as many earning opportunities as possible on survey sites, Hiving can be a good option as an extra site. If you want to just join a few survey sites with the best opportunities, you should instead check of the list of the best sites in your country. How to join Hiving Surveys? If you want to join Hiving Surveys, it is very easy. Just click the link below, and you will be taken to the registration page. Once you have registered you just have to confirm your email. Remember that if you fill out your profile after you join, you get 300 points joining bonus right away. If you have any comments, questions, or have any experiences with Hiving Surveys yourself, I would love to hear from you in a comment below. Hiving Surveys is a legit survey site. It does however have limited earning opportunities, and it can take some patience. But it is easy to use and has a low payout threshold, so as an extra site it can be worth considering. There are however sites with better and more opportunities. 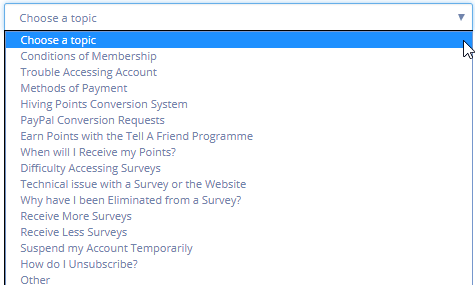 not sure what you mean – are you having problems with Hiving Surveys? I have not seen an app from Hiving so as far as I am aware there is no app. But the website is optimized for mobile so you can use it on mobile.